What Are the Functions of the Long Legs of a Cheetah? The physical differences are obvious when you compare a cheetah to another big cat. Cheetahs have smaller, rounder heads and their bodies are long and sleek. Cheetahs legs are quite long, too, and at the end of their lengthy limbs are paws that are more narrow than those on the other big cats of the wild. Long legs are the foundation of their build, a design that makes cheetahs the fastest land mammals in the world. The way a cheetah is built, specifically the length of his legs, is what gives him his speed, up to 70 mph. Long legs allow cheetahs to take huge strides when running. The shape of their hind legs enhances their speed, too. The hind legs store up energy much like a spring does so that when the cheetah steps down on them and pushes off, the energy is released, explosively driving him forward. 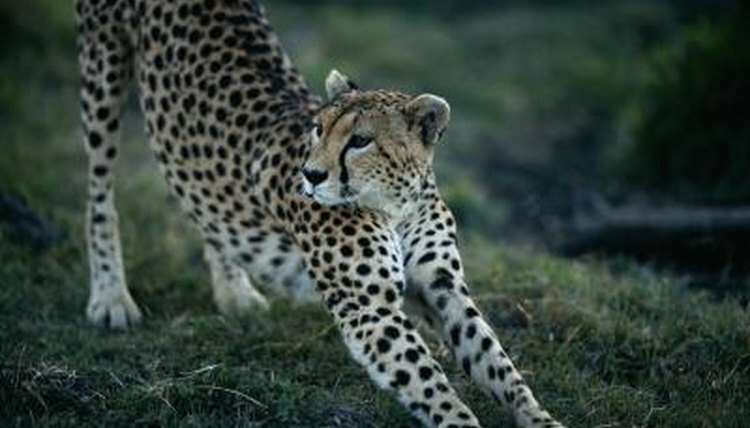 The cheetah's swiftness is largely based in his long legs, but other parts of his body pitch in to work together to help him move with extreme velocity. His sleek body is aerodynamic, and his flexible spine acts as an extended spring for his hind legs to help with additional stride size. Cheetahs use their long tails for balance so they don't wipe out when they make a sharp turn at high speed. Cheetahs rely on the speed their legs generate to hunt during the day. While their big cat cousins such as lions, pumas and leopards hunt at night, the cheetah hunts in the morning or the afternoon. He relies on his eyesight to locate prey and then sidles up to within 50 yards of his meal before engaging his legs to spring into action and charge at full speed. Those long legs don't always mean a successful hunt for cheetahs. The Encyclopedia of Life says that most cheetah hunts fail. Although they are swift of foot, cheetahs are sprinters who only maintain their high speed for short amounts of time, typically up to a minute. When a cheetah charges the prey he has in his sights, it could get away if it isn't knocked down by the force of the cat hitting it. How Often Does a Cheetah Catch Prey?